My favourite character in the book is Tsunami because of her bravery, loyalty, determination and true want for freedom. I think that if would be fun to be friends with Starflight because if you have a question to ask he will answer it in full. Sometimes he’s what people call a “goody-two-shoes” but Starflight is someone you can really depend on. One of my favourite parts in the story is when Clay has to find a way out of the caves that they were imprisoned in. The only way out is through a small underground river opening. Once through they have to find the secret opening. 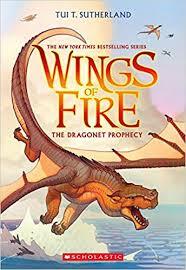 I liked this story because of how you have to look at it from a different perspective than you would for other books because the characters are DRAGONS!! I would say that this is a boy and girl book for 10 to 20 years of age. Review by Drew, age 13, grade 8. This book review is from Canadian Teacher Magazine’s Jan/Feb 2013 issue.